Blue Lagoon Slot Machine Guide & Review - Casino Answers! Blue Lagoon is a 3-reel, 1-line classic slot machine from Vegas Technology. 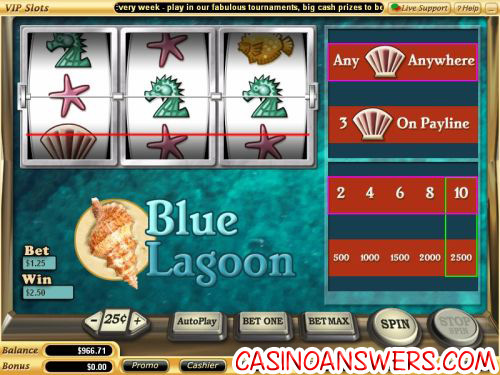 You can play the Blue Lagoon slot machine at US-friendly online casinos Online Vegas Casino and Caribbean Gold Casino. Blue Lagoon is an underwater-themed slot machine with symbols such as Blowfish, Seahorse, Starfish and the Seashell symbol. To play the Blue Lagoon slot machine, choose your coin value between $0.10, $0.25, $0.50, $1, $5 and $10. Then, choose how many coins you wish to bet (up to 5) The minimum bet on the Blue Lagoon slot is $0.10 and the maximum bet is $50 per spin. To play all 5 coins, hit “Bet Max” and you will spin the reels automatically. For any other bet, click “Bet One” the appropriate number of times and then hit the “Spin” button. There are only two winning combinations on the Blue Lagoon slot machine: first is the 3 Seashell symbols on the payline winning combination. This is the top jackpot on Blue Lagoon. Depending on how many coins you play, this winning combination is worth 500, 1000, 1500, 2000 or the top jackpot of 2500 coins. The other winning combination is one Seashell symbol anywhere on the reels. This is a very common winning combination and will win you 2, 4, 6, 8 or 10 coins, depending on how many coins you bet. Blue Lagoon has a skill stop feature. In the middle of any spin, you can hit the “Stop Spin” button at the right of the game buttons and the reels will halt. You will be paid out for any winning combinations you receive. Blue Lagoon has an autoplay mode that can be accessed using the “AutoPlay” button next to the bet game buttons. Spin settings in Blue Lagoon’s autoplay mode are the number of spins (5, 10, 25, 50, 100, 250 or 500) and the number of seconds between spins (1, 1.5 or 2). The stop settings include stop once all spins are complete, stop when jackpot is won, stop if a win exceeds or equals ($50, $100, $150, $200 or $250), stop on any win, stop if credits are increased by ($50, $100, $150, $200 or $250) and stop if credits are decreased by ($50, $100, $150, $200 or $250). Skill stop is available during the autoplay mode. You may stop autoplay at any time. Looking for a great online casino to play the Blue Lagoon classic slot machine at? You can get a $5000 signup bonus over your first 10 deposits with a special bonus of 4 free slot tournament tickets at Online Vegas Casino! Can USA players play the Blue Lagoon slot machine for real money? Yes, all Vegas Tech casinos are US-friendly, including both casinos Online Vegas Casino and Caribbean Gold Casino. How much can I win on the Blue Lagoon slot? If you bet 5 coins at the maximum coin size of $10 on Blue Lagoon and three Seashell symbols appear on the center payline, you can win $25,000! Blue Laggoon Slot Machine Game?